AsomBroso Extra Anejo Tequila - Aged at least 5 years in French Oak casks, a smooth and mellow sipping Tequila. 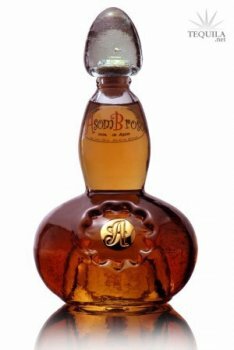 All AsomBroso Tequilas are prepared with only the best hand selected Agave plants at peak maturity, produced using old fashioned methods and state of the art modern technology, using multiple distillation and filtration processes. Initial Taste: Lots of caramel and butterscotch on the entry. Not overly sweet. Very nice. Body: A nice medium body for an anejo. Not syrupy, but thick enough to tell you that it's been aged. A lot of flavors working together. It takes a lot of sips to catch them all: Vanilla, Butterscotch, Toffee, Fruit, Oak, Baking spice, light cinnamon. Finish: No burn and a bit of a muted finish. For 5 year aged, I'm not expecting spicy, but I was expecting more. Extra smooth. What hasn't been said about the Asom Broso bottles already. I got it for $85 at the Tequila Garden (Thanks tequila.net for the banner ad), but I've seen it as high as $250...more often around $200. 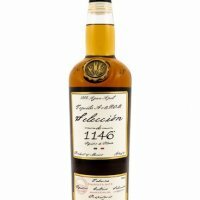 This is a great tequila to be savored. I procured a bottle of this for a special price of $80 at a local store. The store's price tag indicated an MSRP of $250, and I have heard other folks mention prices of close to $200, so apparently I got a good deal. The bottle, of course, is undeniable, and this tequila has a very dark color - probably darker than anything I have experienced thus far. The nose on this XA was mostly caramel, but with strong oak and subtle charcoal notes as well. The body was rather light for an XA, with only a slight oiliness - very balanced. The taste reflected the nose, with (burnt) caramel plus a little spice. The finish was smooth with minimal burn - mostly pepper as opposed to alcohol burn - and again more charcoal. The nose filled-up again after the finish, with lingering caramel, wood, and charcoal notes. This is a very complex tequila with a lot going on. I wouldn't spend the $200 MSRP for it, but at a special sub-$100 price it is worth the money for special tastings, and should be savored by those who can appreciate it. This really does set a standard in my book, and having been the third sampling of the AsomBroso line for me it made me a true fan of their products as they're all very distinct, yet have similarities that clearly tie them together. The nose is the best I've encountered without question: a wonderful combination of caramel, butter, what I'd call "the AsomBroso bubble gum" scent which each I've tried shares as a very distinct commonality to the line. A nice warm scent. My wife was with me and noted that I spent much more time just enjoying the aroma than I typically do. I felt like I could have sniffed it all day! I had high hopes that the taste would match the aroma and I was pleasantly surprised that it did indeed. A warm entry that was oily (but not too much) and the caramel was the first thing that hit me, followed by a buttery agave union. A wonderfully long finish with that same buttery agave flavor lingering for what seemed like an eternity. While this is incredibly smooth and almost rich in the flavor there is still a nice presence of agave. This easily makes the short list as one of my favorites and obviously I would highly recommend it.